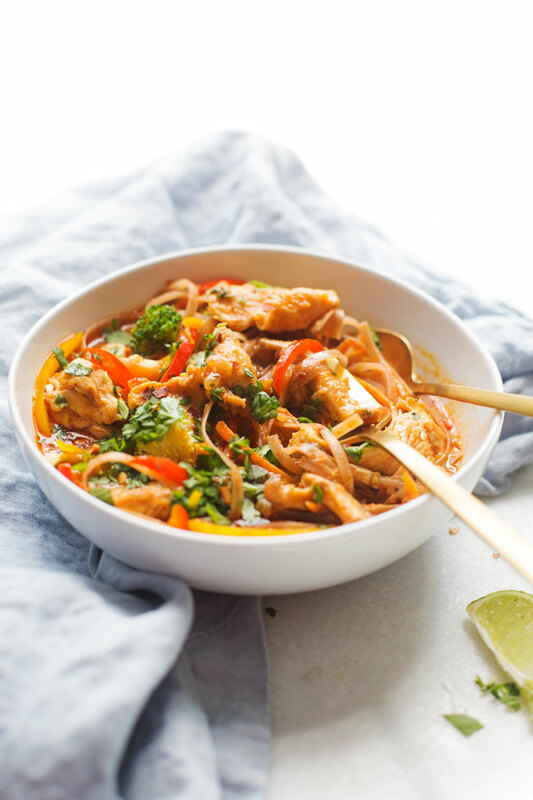 Simple 20 – minute chicken panang curry noodle bowls with veggies. Warm panang curry noodle sauce all cozied up with noodles and your favorite sautéed veggies. 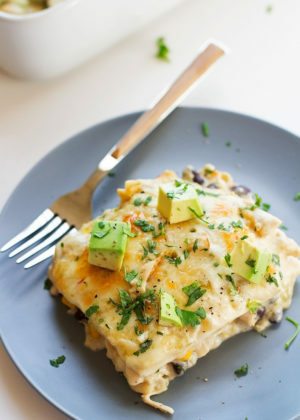 Perfect for chilly, weeknight dinners! 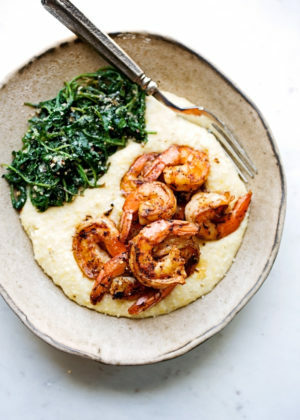 Zippy weeknight dinners at your service. Because that’s exactly what this is. 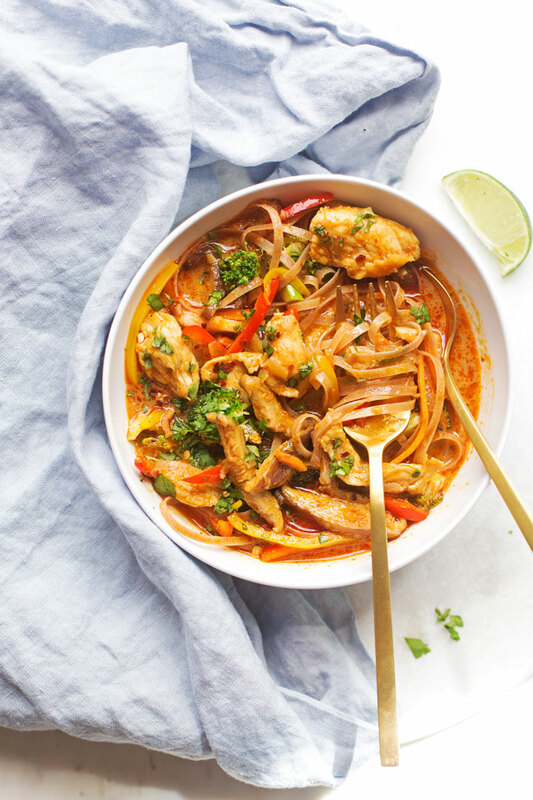 I mean, warm chicken panang curry turned into healthyish curry noodle bowls that take around 20 minutes to prepare and come complete with your favorite sautéed veggies, fresh herbs, and noodles all dressed with a creamy panang curry and a big squeeze of lime juice. We’re talking store bought red curry paste turned into a quick panang curry with a lick of peanut butter and a dash of spices because who can even get their hands on a jar of panang curry paste from the grocery store on a weeknight? Not I! True panang curry makers, this isn’t me trying to give you a heart attack, but rather just my attempt to make your weeknight dinners snappy. Not gonna lie to you — I think I ate curry noodle bowls for like 3-4 days straight for 2 meals a day. Mainly because I just couldn’t get enough of of these brown rice noodles just lightly coated with a thick, almost soup but almost stew-like curry. Now that i’ve got you all excited about these creamy dreamy and in-your-face flavors and textures, let me tell you how we turn red curry paste into panang curry paste. I know. It’s blasphemy. But we’re going to do it anyway. Now, I need you to look for a few ingredients in your red curry paste. 1.) kaffir lime leaves – which most red curry pastes do have 2.) lemongrass and 3.) galangal. These ingredients make the best red curry paste. This is the curry paste I use at home and love. To turn it into panang curry paste. 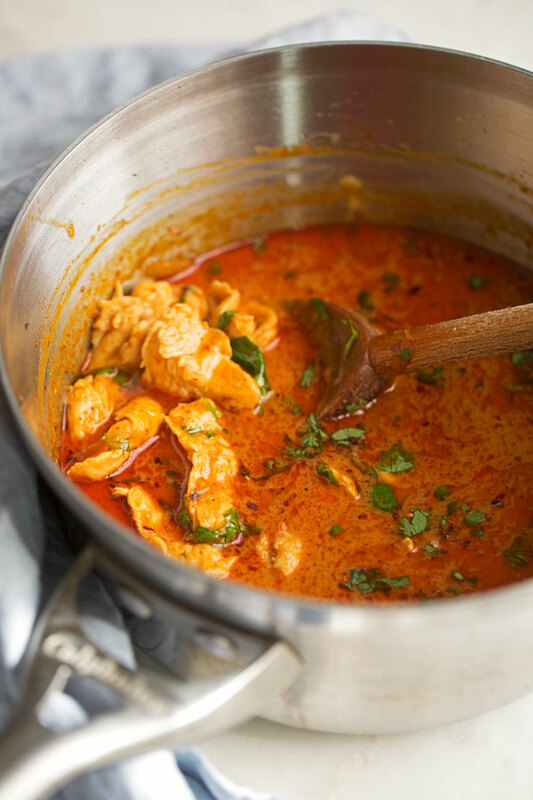 Grab a bowl and 3 tablespoons of red curry concentrate. Add in 1 tablespoon of creamy peanut butter, 1/2 teaspoon coriander power, and 1/4 teaspoon cumin powder. Stir it all together and BAM! Cheaters panang curry paste. Now the veggies for the curry noodle bowls. I’m using broccoli, carrots, shiitake mushrooms, and yellow and orange peppers. But the beauty about this weeknight dinner recipe is that you can pretty much use any veggies you like! Short cuts are totally welcome too. Use pre-washed, and chopped veggies to get this on the table in 20 minutes and if you decide to chop your veggies, it’ll take you maybe around 30 for the whole thing. Zucchini, leftover roasted potatoes, thinly sliced onions, a cabbage mix. It’s all game. It’s all delicious. It’s all covered in homemade panang curry sauce. 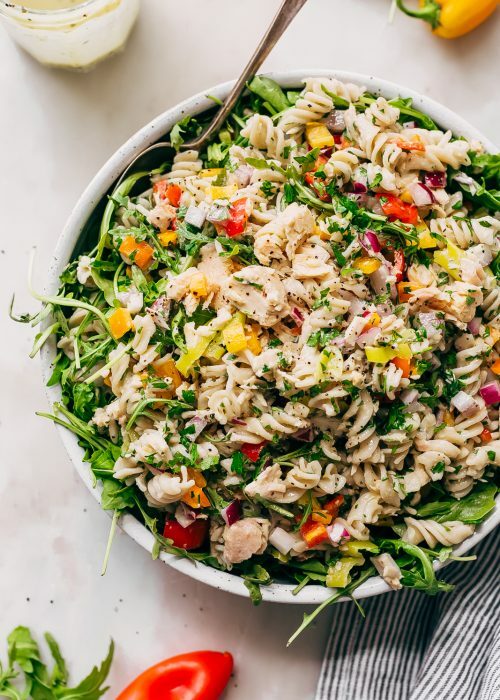 I let the veggies be a little al dente and crunchy because I love texture and the creamy sauce with the soft noodles just begs for a crunch factor. Definitely delicious, healthyish, weeknight curry noodle bowl dinners. 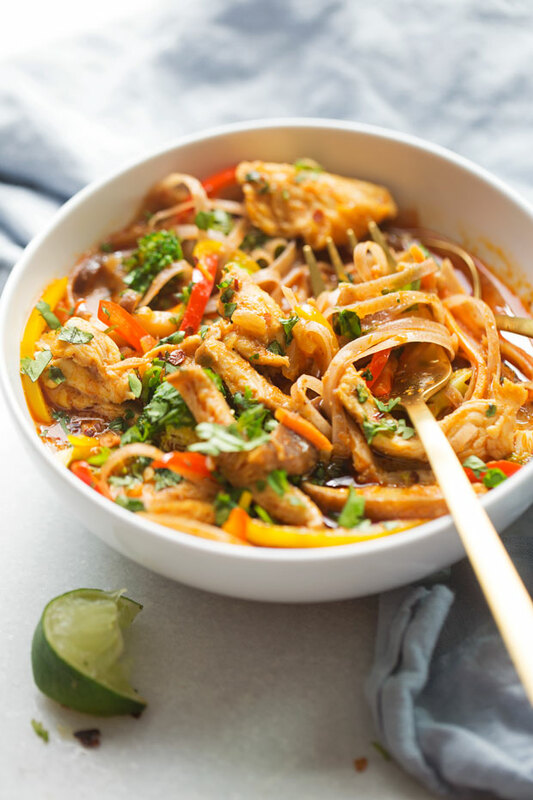 Simple 20 – minute chicken panang curry noodle bowls with veggies. Warm panang curry noodle sauce all cozied up with noodles and your favorite sautéed veggies. 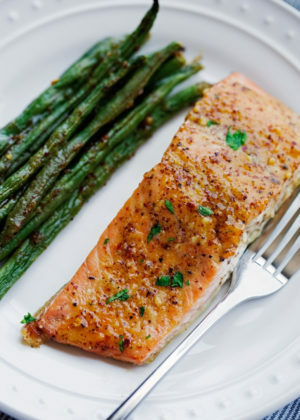 Perfect for chilly weeknight dinner! PANANG CURRY PASTE: In a small bowl, combine the ingredients for the paste and mix using a spoon or a small spatula. Set aside. CURRY: Heat the oil in a sauce pan, add the shallots and sauté for 3-4 minutes or until the shallot become soft and translucent. Add the ginger and cook for 30 seconds before adding in 1/4 of the coconut milk along with the prepared curry paste. Cook the paste mixture for 1 minute. Add the chicken and stir to coat, cooking for 2-3 minutes. If at any point the sauce begins to stick to the pan, use a couple tablespoons of the broth to deglaze the pan. The coconut milk/chicken broth mixture will start to evaporate leaving a thick paste. Add in the rest of the coconut milk, chicken broth, fish sauce, and sugar and allow the sauce to simmer on low for 5-10 minutes while you prepare the veggies. VEGGIES: Heat a large skillet over medium high heat. Drizzle in a little olive oil and add the veggies. 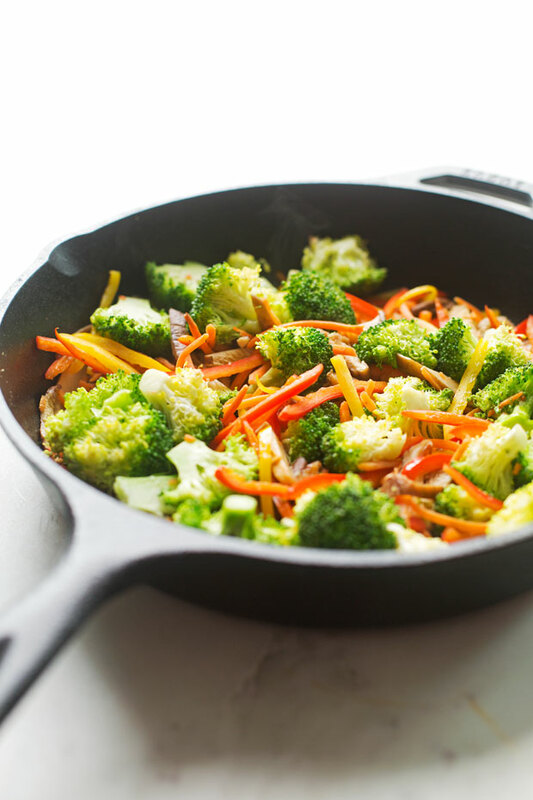 Sauteé for just 3-5 minutes or until the veggies brighten in color. ASSEMBLE: Place the prepared noodles in a bowl, top with the sauteed veggies and the prepared curry. 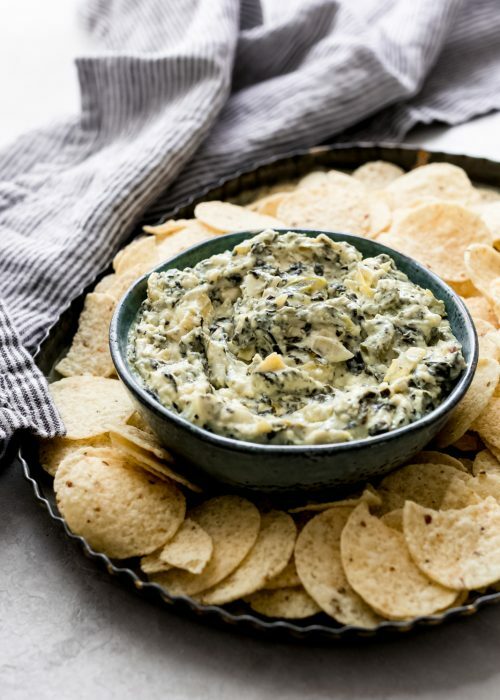 Serve with cilantro and lime wedges! To make this a 20-minute recipe, I used cleaned and cut veggies found in the refrigerated section of the grocery store. You can also prep your own veggies, but keep in mind that this will take you longer than the 20 minutes for the recipe. You can use just about anything you like for the mixed veggies, even roasted, diced potatoes. Zucchini, corn, cabbage mix, and sliced onions are some other veggies that would taste great! 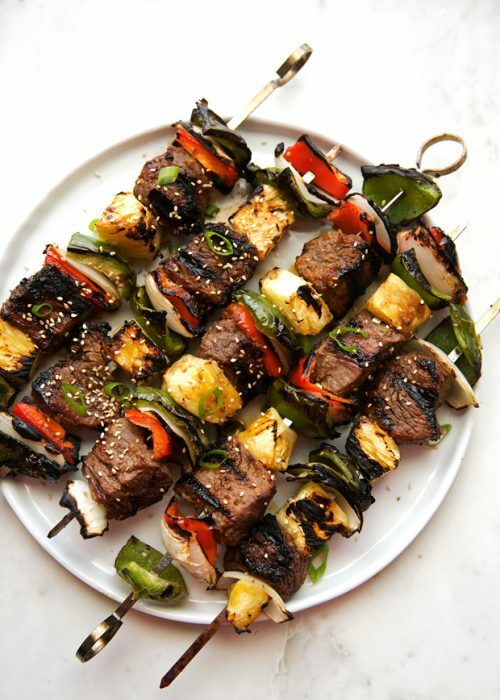 Can’t wait to make this, after reading all of the comments, I feel confident that I can wow my family with this dish by using veggies they love, so many options. And if by some unfortunate result they don’t like it, I can twirl and slurp my way through the entire dish, thanks! 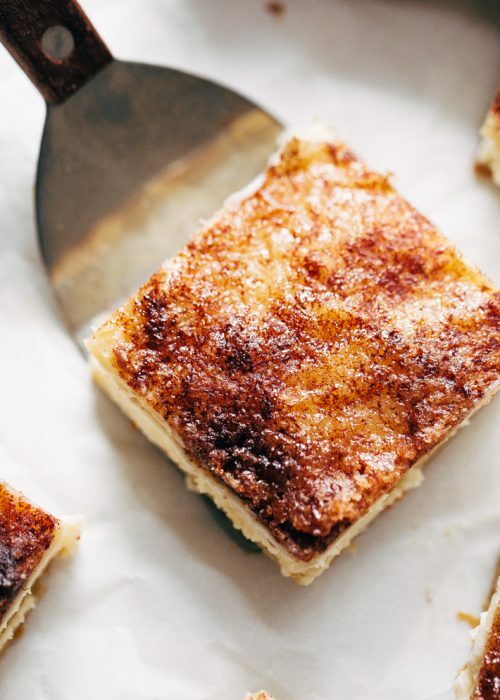 Can I use half and half or cream instead of coconut milk? Can I use sesame oil instead of coconut oil? This was incredible!! 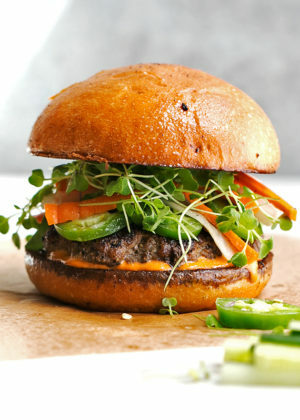 Better than takeout! 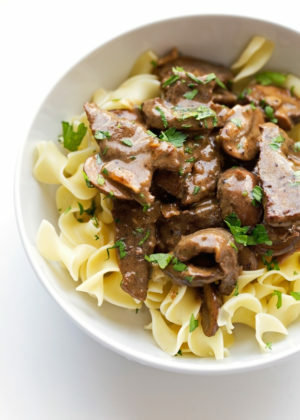 I am thinking about making this for dinner tonight. Do you think it would be good to use Udon noodles instead of flat rice noodles? Udon noodles should work just fine here! This is delicious! Question do we have nutritional info on this? Glad you enjoyed it, Vanessa! If you’d like to get nutritional content for any of the recipes on the blog you can simply paste the URL of the page into myfitnesspal.com and it will automatically calculate it for you! Also, you can customize it with the brand of products you use for more accuracy. Hope that helps! My husband can’t take hot food,and I noticed the 1st ingredient in curry paste is chili-so is it v hot or does it get mild with the other additions or is there a curry paste that comes without chili’s? Hi Rita! This will vary from brand to brand. Personally, we didn’t find it to be spicy with the brand I used but everyone’s tolerance for spice is different. Unfortunately, I haven’t come across a curry paste that didn’t contain any chilis but you may want to see if you can find one that is marked as ‘mild’. If not, I suggest using less of the paste, maybe around 1 tablespoon. Hope that helps! So delicious! Only discovered your recipe about a week ago and have made it twice already! I just used a cooked chicken and shredded the meat and added onion, red capsicum, broccoli and zucchini for the veggies. I made this today using broccoli, pea pods, sautéed onion, shiitake and button mushrooms! It was scrumptious! I also used shrimp for me, chicken for my husband. (I bought an already cooked breast). I sautéed the vegetables first and used the same pan for the curry….reversed the order. This is very close to the Panang Curry we get at our local Thai restaurant! Such a beautiful meal, added a little extra heat by using some fresh Carolina reaper chilli as a garnish. This will be on the menu again soon! Thoughts on subbing tofu for chicken and vegetable broth for the chicken broth to make this vegetarian? I think tofu would work really well with the curry flavors! I usually like to pan fry tofu beforehand with a light dusting of cornstarch and a pinch of salt. And then add the tofu to the curry near the end. Hi Rachel, the broth does taste like coconut as we’re using a full can of coconut milk + coconut oil to saute the paste in. The curry paste does aid in changing the flavor of the coconut milk a bit but it just really depends on how strongly he feels about it! I liked this a lot, but I think when I make it again (and i for sure will!) I will add less broth. I thought it was a little runny. I would also like to figure out a way to use fewer pans–could the veg cook in the sauce maybe? Glad to hear you enjoyed it, Katie. Another reader suggested sauteing the veggies in the same pot as you would prepare the curry and just reversing the order. I’ve made this twice now and both times we really liked it! I used zucchini noodles – just put them raw into bowls and then ladled the curry over them when serving to cook them a bit. Also, I used frozen chopped veggies that I froze myself to use in stir fries (blanched, then froze on sheet pans before transferring to ziplock bags), and I just dropped handfuls of them frozen straight into the simmering curry without bothering to thaw or sauté first. Tasted fine and made the recipe even faster to prepare. A few more notes: the second time I made it I didn’t have any chicken broth so I made some from bouillon and it worked just fine. 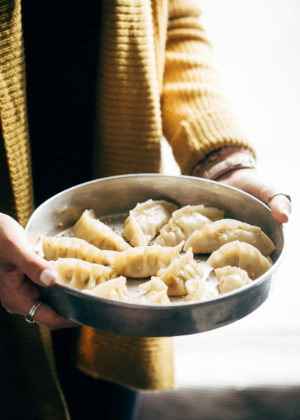 Two other changes I made was to use coconut sugar in place of regular sugar and use salt instead of fish sauce because I don’t like how fish sauce tastes in food I cook at home (never noticed it at a Thai restaurant – I must be using it wrong). 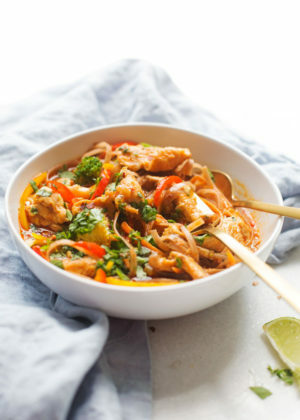 I really like the technique of this recipe and plan to try preparing red curry or green curry the same way if we get tired of panang curry. 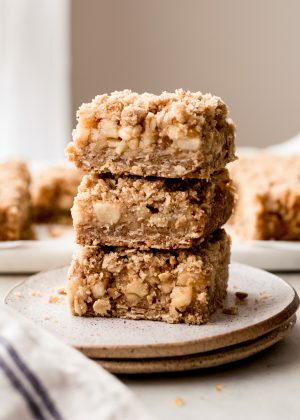 I’m allergic to peanuts, is the peanut butter critical to the recipe? Thanks! what is panang? 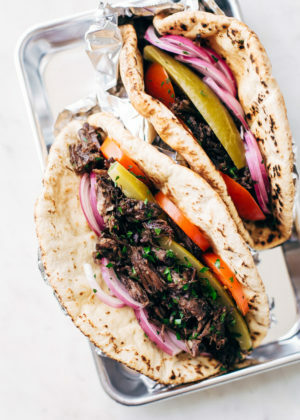 where is origin of this recipe? The curry was delicious and easy, but I think 20 minutes is a real stretch. It took us 45 minutes at least on our first try. This is a great recipe, totally accessible for those who aren’t confident in Thai cooking! My favorite combo is peppers, onions, bean sprouts, carrots, and kaffir leaves, with crispy tofu instead of chicken ? Thanks! Your photos are so gorgeous! I’m still working on my photography, and your blog is great inspiration. Thank you so much Katherine! 🙂 Best of luck to you! 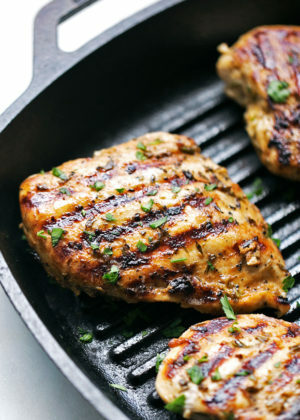 Was the chicken raw or cooked prior to adding to pan? I used raw chicken. But you could make this recipe with cooked chicken. You would just add it in during the last 5 minutes when the sauce is simmering (step #2).